In Asia, massages are considered as a natural healing therapy. Treatments and massages are holistic, considering that Health and Beauty. Result from balance between Body, Mental and Spirit. The beautiful Nature of Laos contributes to restore this harmony. A subtle mix of traditionnal Thai and Laos massages. This energetic massage is especially efficient to releive from muscular fatigue and pains., boost the immune system, and regain joints mobility. Body is carefully stretched. The therapist uses hands, elbows, knees, and feet to press some specific points through Sen Lines. This massage helps the body to enhance the natural healing process. A warm natural compress, fulfilled of Lemongrass, Eucalyptus, Curcuma and Camphor, is applied to the body for a deep muscular and nervous release. Fragrances of Herbs make your senses in harmony, balancing your mental and your body. This traditional treatment is highly efficient to heal some fragilized body areas, on which a manual therapy would not be adapted. This delicious smooth massage is especially recommanded to calm mind, relax muscle tensions, and release physical and mental stress . Blood circulation and lymph system are boosted. The pure organic Coconut Oil is the perfect natural ingredient to make your skin nourished, softer and brilliant. Experience 1h15 of natural treatment, with organic ingredients like Curcuma, Cucumber, Honey and Lime, Facial Herbal Compress. This soft treatment makes you skin cleaned and purified, for a brilliant complexion. This massage suits both men and women, and is also efficient to calm your mind and to make you feel deeply relaxed. It is suit for all skin type. Facial 30mn, is a shorter treatment, with also only organic ingredients like Curcuma, Rose, Clay….and gentle manual massage procedure. Curcuma, Honey, Tamarind or papaya, Coconut Oil etc…. This refreshed treatment cleans smoothly your skin, eliminates the dead cells, and stimulate the new ones. Your skins looks younger, it is clear, purified and rejuvenated. This fresh home-made body scrub is energizing and stimulating. Experiment a pure instant of wellbeing, unique in the south of Laos ; an absolute sensory experience. The precious coconut oil is applied on dried hair. This scalp massage stimulates the growth, and makes your hair stronger and healthy. 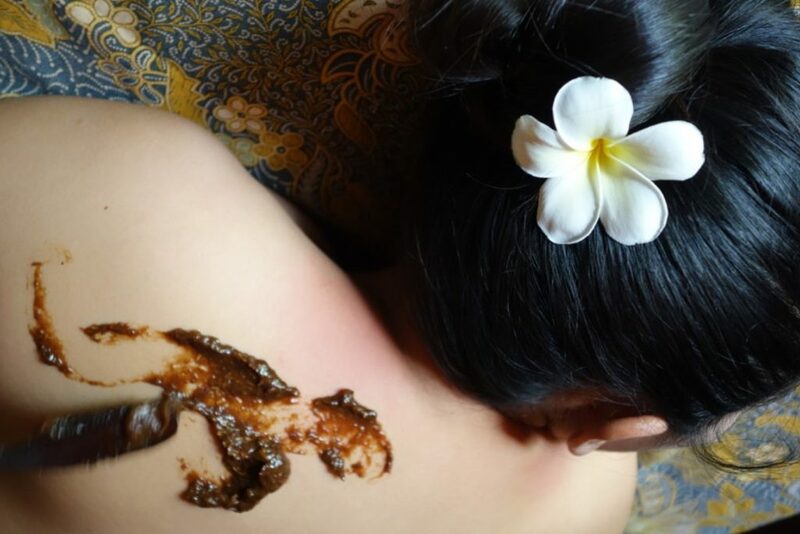 This treatment is used by Lao women, especially careful to the beauty and health of their hair.